I love popping over to 3 Sheets to see what's been happening in Kylie's experimental playground. 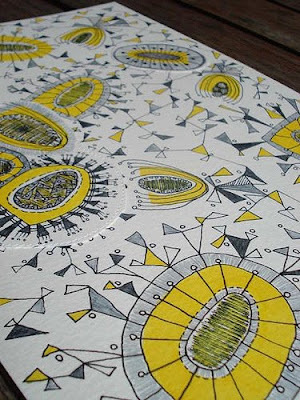 Her knack for combining texture, technique and shape is enough to make any textile and fabric design loving girl swoon. 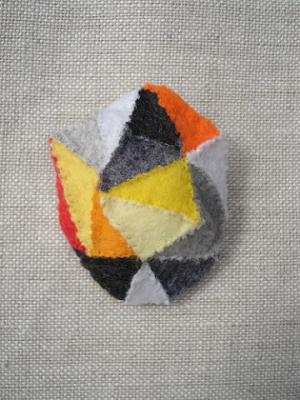 There aren't many people with the creative mind power to pull off brooches inspired by geometric abstraction so successfully. With a new shop, a keen eye and future plans for more designs Kylie is definitely one to watch. I couldn’t tell you what inspired me exactly as it’s something I’ve always done. I did my first oil painting at the age of 6 and my mother still has it... I look at it now and can’t believe I actually did it. I have so many art prizes from childhood – painting was a major part of my life until the end of high school. I still have the same sewing box I had as a child – I used to make all the clothes for my Barbie and other dolls. I even have pots I made and screen printing from childhood... So, where did it all come from? I have no idea! My mother tells me I just did it on my own and that it was always just who I was :) I like that – it helps me have more confidence in myself and what I’m making. Sewing. I love it so much. I love fabric and get so much out of creating clothing. The amazing textures and the way it falls inspires me so much. I don’t use patterns as I seem to have some kind of (undiagnosed!) dyslexia when it comes to following instructions ;) I just cut and do whatever the fabric seems to want me to do with it. 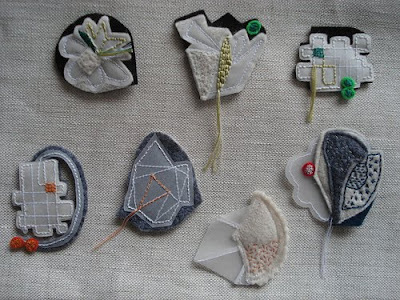 I’ve become very distracted by my brooches lately. There are many things I love about making them – in a way they are mini-creations and the scope for incorporating different materials is something I find so fascinating. So, I still love making them but I’d really like to get back to making one-off creations with fabric. This also includes doing more screen printing of my own fabric designs. What fantastic things , thanks for showing us . Great interview and really inspiring - thanks! Really enjoyed reading this. I love Kylie's blogs and work. Great interview Rebecca. Kylie, I've always love you but now I think I love you more! mmmmm. i love reading the stories behind everyone's making and doing - the way people are "just creative" and haven't planned to be doing the things they're doing.. Thanks again, Rebecca, for asking the questions and sharing with us. more and more inspiration every day! Kylie you are so very talented and I am so happy I will be around to delight in whatever you will be creating next! Thank you for a lovely interview! I have been following Kylie's blog for a while now and really enjoyed learning more about her. Very interesting background. Your interviews are great Bec. Fab interview..what a gorgeous creative soul you are, and so wonderful your mother allowed you the space to nurture this. It was great to get a little more insight.